» Register for the Next FREE Webinar with Donna Fishter! 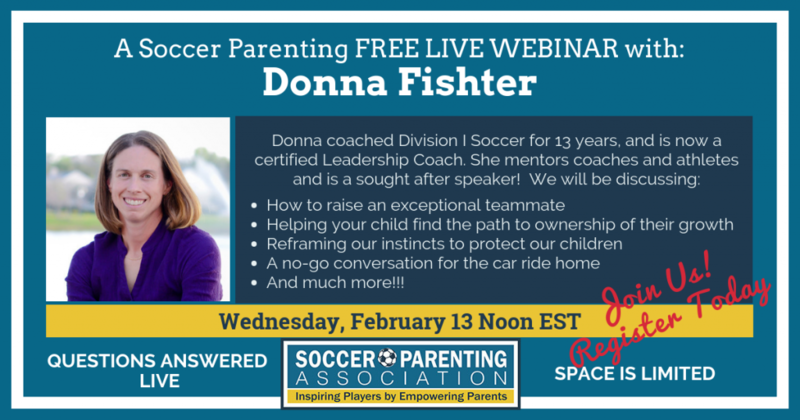 Register for the Next FREE Webinar with Donna Fishter! I am really looking forward to this conversation with Donna Fishter, "Big D"! All of our previous interactions have been quick conversations in Convention Halls or via social media, so sitting down with her for an hour and diving deep in her work on leadership and team building....can't wait! Helping your child find their path to ownership of their growth. Donna has coached for over 20 years at the youth, high school & college level. For 13 years she coached at University of Central Florida with Amanda Cromwell (currently UCLA Head Coach) and together they built UCF into a Top25 program. Donna stepped out of the “x’s and o’s” in order to focus entirely on leadership training and culture development for coaches, teams, and athletes across the country as these are vital pieces to high performance and success. Donna mentors coaches & athletes at all levels and she consults for NCAA collegiate teams in several different sports. Donna has multiple teams winning conference championships and teams that consistently compete in post-season including…one National Champion and two Runner-Up National Champions. In 2011, Donna became a certified Leadership Coach with the John Maxwell Coaching Team. She has been a regular speaker at the United Soccer Coaches Convention, interviewed on several podcasts and is an instructor for the U.S. Soccer Academy Director Course. Donna is known in the coaching world as “Big D” and is driven everyday by her passion for people.